The Fox River Radio League will be holding a free eight class course where you can learn everything you need to upgrade to your General Class Amateur Radio License. 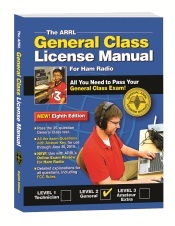 The textbook for the class will be The ARRL General Class License Manual, 8th Edition. Be sure you have a copy for class. Books can be purchased online through www.arrl.org at local ham-fests or several other online sources. Click the book to find it on the ARRL site. Notice a spiral bound version is also available on their site. The VE test session after this class will be held on November 21st.